The 2018 Bank of America Roval 400 was a Monster Energy NASCAR Cup Series race that was held on September 30, 2018, at Charlotte Motor Speedway in Concord, North Carolina. Contested over 109 laps on the 2.28-mile (3.67 km) road course, it was the 29th race of the 2018 Monster Energy NASCAR Cup Series season, third race of the Playoffs, and final race of the Round of 16. This was the first race to use Charlotte's "Roval" road course layout. 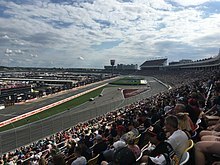 For 2018, deviating from past NASCAR events at Charlotte, the race will utilize a road course configuration of Charlotte Motor Speedway, promoted and trademarked as the "Roval". The course is 2.28 miles (3.67 km) in length and features 17 turns, utilizing the infield road course and portions of the oval track. The race will be contested over a scheduled distance of 109 laps, 400 kilometres (250 mi). During July 2018 tests on the road course, concerns were raised over drivers "cheating" designated chicanes on the course. The chicanes were modified with additional tire barriers and rumble strips in order to encourage drivers to properly drive through them, and NASCAR will enforce drive-through penalties on drivers who illegally "short-cut" parts of the course. The chicanes will not be used during pace laps, nor will they be used during restarts. Kyle Busch was the fastest in the first practice session with a time of 77.145 seconds and a speed of 106.397 mph (171.229 km/h). Kurt Busch scored the pole for the race with a time of 76.805 and a speed of 106.868 mph (171.987 km/h). Jimmie Johnson was the fastest in the second practice session with a time of 78.043 seconds and a speed of 105.173 mph (169.260 km/h). Brad Keselowski was the fastest in the final practice session with a time of 77.730 seconds and a speed of 105.596 mph (169.940 km/h). Ryan Blaney drives to the finish line in the opposite direction after winning the 2018 Bank of America 400. NBC Sports covered the race on the television side. Rick Allen, Jeff Burton, Steve Letarte and Dale Earnhardt Jr. had the call in the booth for the race. Parker Kligerman called from different locations around the 17-turn ROVAL. Dave Burns, Marty Snider and Kelli Stavast reported from pit lane during the race. The Performance Racing Network had the radio call for the race, which was simulcast on Sirius XM NASCAR Radio. ^ "2018 schedule". Jayski.com. Jayski's Silly Season Site. May 5, 2017. Retrieved August 19, 2018. ^ "Charlotte Motor Speedway". NASCAR.com. NASCAR Media Group, LLC. January 3, 2013. Retrieved August 19, 2018. ^ "Entry List". MRN.com. Motor Racing Network. September 24, 2018. Retrieved September 24, 2018. ^ "First Practice Results". MRN.com. Motor Racing Network. September 28, 2018. Retrieved September 28, 2018. ^ "Starting Lineup". MRN.com. Motor Racing Network. September 28, 2018. Retrieved September 28, 2018. ^ "Second Practice Results". MRN.com. Motor Racing Network. September 29, 2018. Retrieved September 29, 2018. ^ "Final Practice Results". MRN.com. Motor Racing Network. September 29, 2018. Retrieved September 29, 2018. ^ "Bank of America Roval 400 Results". MRN.com. Motor Racing Network. September 30, 2018. Retrieved September 30, 2018. ^ "Points standings" (PDF). Jayski.com. Jayski's Silly Season Site. October 1, 2018. Retrieved October 1, 2018. ^ "Manufacturer standings" (PDF). Jayski.com. Jayski's Silly Season Site. October 1, 2018. Retrieved October 1, 2018. ^ "Charlotte final TV ratings". Jayski's Silly Season Site. ESPN. Retrieved 4 October 2018. ^ "New layout for Charlotte Motor Speedway road course". NASCAR.com. 2018-01-22. Retrieved 2018-09-28. ^ "Everything to know for Sunday's race on the Charlotte roval". ESPN.com. Retrieved 2018-09-28. ^ "NASCAR Cup race on Charlotte Roval to see length reduced". Retrieved July 8, 2018. ^ "No more shortcut: NASCAR's Roval tests to resume on course altered to stop 'cheating'". Charlotte Observer. Retrieved 2018-09-28. ^ "Charlotte road course 101: What you need to know". NASCAR.com. 2018-09-26. Retrieved 2018-09-28. ^ Utter, Jim (September 28, 2018). "Kyle Busch tops incident-filled Roval practice at Charlotte". Motorsport.com. Charlotte, North Carolina: Motorsport Network. Retrieved September 28, 2018. ^ Reed, Steve (September 28, 2018). "Kurt Busch wins pole for playoff race at Charlotte's 'roval'". Associated Press. Charlotte, North Carolina: AP Sports. Associated Press. Retrieved September 28, 2018. ^ Utter, Jim (September 29, 2018). "Jimmie Johnson fastest as big incidents slow second Roval practice". Motorsport.com. Charlotte, North Carolina: Motorsport Network. Retrieved September 29, 2018. ^ Utter, Jim (September 29, 2018). "Brad Keselowski goes fastest in final Roval practice, then wrecks". Motorsport.com. Charlotte, North Carolina: Motorsport Network. Retrieved September 29, 2018.